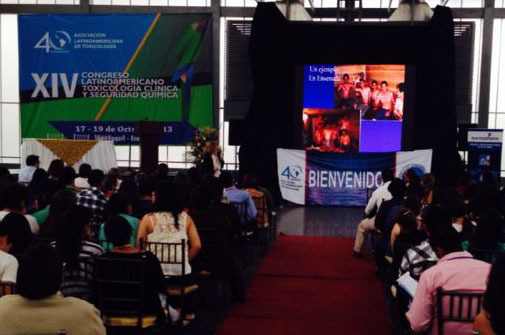 The Narconon sauna detoxification program and other methods of handling addiction were introduced to international toxicology conference in Ecuador. Dr. Anna Tagliaferro, Medical Director of Narconon International (front row, left). 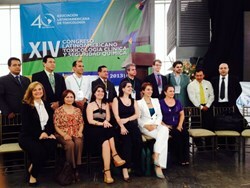 Mr. Jose de Carpio, Latin America Consultant for Narconon (back row, far left). Dr. Anna Zaucha Tagliaferro, Medical Director of Narconon International in Los Angeles, California, and José de Carpio, Narconon Latin American Consultant, presented the theory and methods of the Narconon drug rehabilitation program to an international toxicology conference, held at the Crystal Palace in Guayaquil, Ecuador between 17 and 18 October, 2013. Nearly 600 persons attended the conference in this large port city. The conference covered a broad range chemical and other toxicology subjects, ranging from ecological issues such as agricultural, site contamination, and ecotoxicology to forensics and risk evaluation, to issues of drug rehabilitation and drug toxins. Dr. Tagliaferro, M.D., originally practiced medicine in Caracas, Venezuela, where she first encountered the issues of drug addicts presenting themselves with all their personal physical and life problems. She began working with Narconon drug rehab centers in the United States when she immigrated some years ago, as a specialist in the Narconon sauna detoxification procedure, and then was invited to come to Narconon International to be its new Medical Director. Dr. Tagliaferro presented the science background, literature, and delivery techniques of Narconon’s sauna sweat out program which helps a recovering drug addict (or anyone else with toxicity issues) to safely and healthfully reduce the body burden of stored drug and other toxic residuals. She told the congress that the Narconon sauna detox is based on the research of humanitarian L. Ron Hubbard and has been studied across a broad range of applications including helping environmental or other disaster victims such as after the Chernobyl reactor explosion in the Ukraine and the World Trade Center collapse in New York. It has even been tested to help police in Utah who were disabled after being exposed to toxic chemicals in raids on methamphetamine labs. Dr. Tagliaferro presented the treatment procedure -- use of a specific regimen of vitamins and minerals in combination with exercise and repeated episodes of sweating in low-heat, well-ventilated, dry saunas. She demonstrated evidence of many different kinds of gains reported by those who have completed this procedure, including IQ gain, personality changes, and a generally improved sense of well being. In closing, she said that she agreed with the previous Narconon Medical Director, Dr. Megan Shields, who said, after having supervised more than 15,000 persons through this cleansing protocol, "I think that the Hubbard detoxification program is the single greatest advance in addressing the problems of world pollution and drug addiction. It’s the single greatest advance. It’s cheap. It’s simple. And the results are beyond price." Jose De Carpio is an Ecuadoran national now working with Narconon International. He had earlier returned from the U.S. to Ecuador to introduce to some of its drug rehab centers the Narconon First Step Program, a method using nutrition and simple assists and exercises to help addicts withdraw from drugs more rapidly and less painfully and experience less persistent discomfort afterwards. He presented the same First Step methodology to the Toxicology Congress. Staff are now in training to later open up a Narconon drug rehab center in Ecuador. For some years there has been a Narconon center in Colombia and Argentina as well as several in Mexico, including Narconon Tijuana whose president is Padre Jaime Lares. There are also nearly 200 Twelve Step (Narcotics Anonymous) groups across Mexico now using the Narconon First Step procedure. Dr. Tagliaferro and Mr. De Carpio are going on from the toxicology conference to consult with health authorities in the Galapagos regarding Narconon help with drug addiction issues. For more information on the Narconon program or centers anywhere in the world, please visit http://www.narconon.org.